To lighten the mood of my otherwise impeding crushing defeat against Bart + Galleion 2.d3.... cause 1.d3 was a flop, we played in a bright day glow green table cloth. Notes on this list. The sniper was the first 2 point model I could grab. It synergies well enough with Backlash. However I did drop Aiyanna and Holt for the Artificer, which I realised was a brilliant thing to do, however it might still hurt not having Aiyanna and Holt. At the moment I'm considering dropping eEyriss and the sniper for A&H and another Arcanist. some other Merc character stuff. Movement after turn 1. The Artificer moves up and starts Face Booking, the MHSF crowed around to within 3 inches to watch, its so enthralling that they are all immune to blast damage. Halbs take up position expecting to die. Dahlia starts singing and Skarath slithers into the zone. Galleon opens up and starts blowing away my Halberdiers, the Nyss assist with a few combines and destroy some more thanks to extended range provided by one of the character solo's. Bart has feated. Eyriss runs in to be annoying and gets knocked down. 3 out of 4 of my Halberdiers also get knocked over for lols. 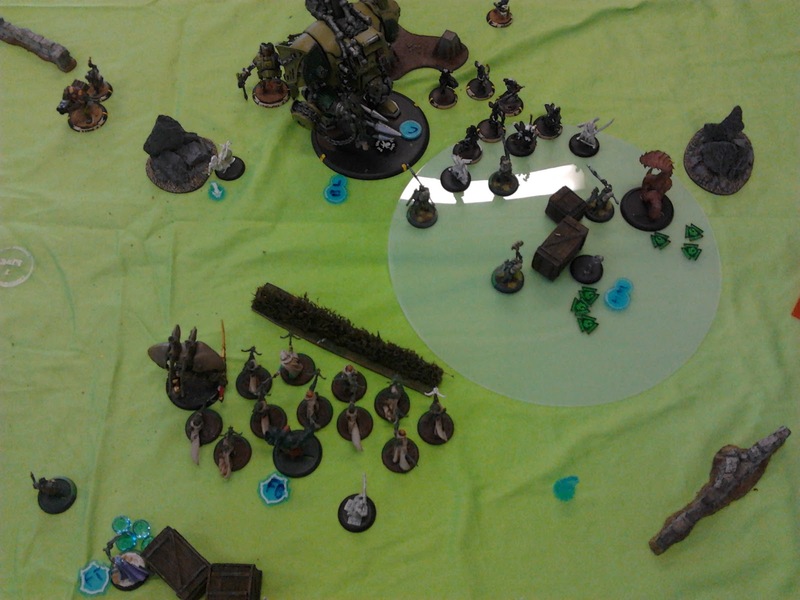 The Pheonix advances careful not to get knocked down, Kaelyssa Feats and moves to the left and arcs Backlash on to the colossal, Skarath comes up the side and sprays down 4 Nyss, killing one and tagging the Colossal triggering the first point of Backlash and corroding it. 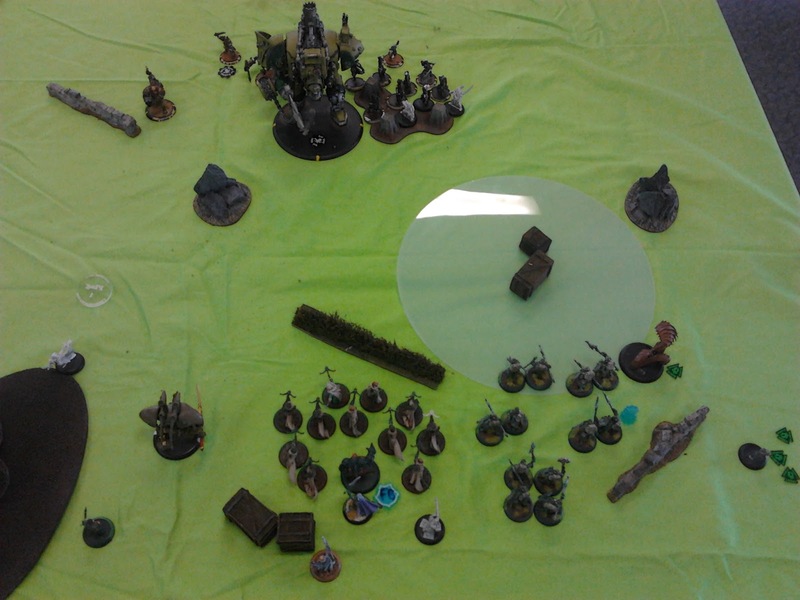 The strike force open up and take out half the Galleon and leaving Bart on about 10 hit points. So I cant be charged and I'm all stealth. The Nyss plink away at Skarath and are ineffectual, Galleon advances and snipes off Wyshnalyr with blast damage rolls. 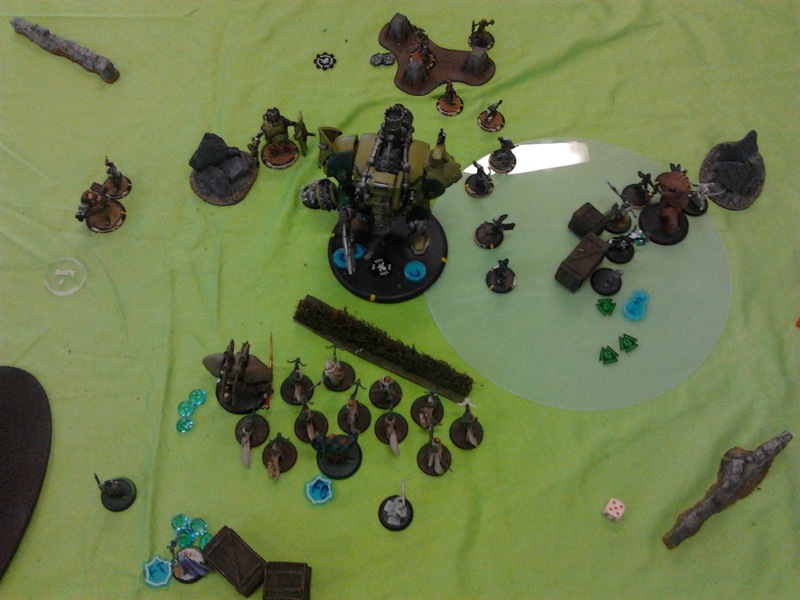 Corrosion kicks Bart for another point via Backlash on the Colossal. Dirty Meg repairs the Colossal fora whopping 1 point. Kaelyssa upkeeps Backlash and drops 3 on the Pheonix. The strike force spark up, I only needed 10 to do any damage out of 11 + anything else I can throw at it. The last Strike Force kills the Colossal and kills Bart with Backlash with the same attack.